We carry an extensive range of Protex Discs and the range offered by Protex is second to none. The Protex Range of disc rotors and drums has been established and proven in the market. Protex disc rotors and drums are now recognised as a leading brand in the automotive aftermarket. The range now has over 1900 references. Both hat and hub type rotors are available for most vehicles. All Protex rotors and drums are manufactured by World class manufacturers. Protex standard brake discs offer unparalleled range and vehicle coverage. Ground and balanced ensuring maximum bedding in and trouble free operation straight out of the box. Protex Brake disc rotors are coated in rust preventative oil. Protex brake drums are available in a wide range of applications to suit all popular drum brake models. From the smaller two door hatch right up to the largest commercial vehicles. There is a Protex brake drum to suit your application. Need NEW Discs or Drums for your car? 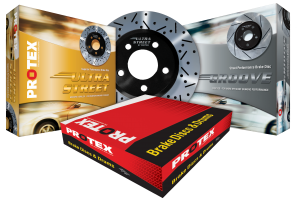 Auto Brake Parts are able to supply only or supply and fit your new Protex Standard brake discs or drums. Ultra street brake discs are manufactured from revolutionary technologically advanced materials providing enhanced braking performance and shorter stopping distances. The hat/hub, rim, grooves and holes are finished in a traditional sports red acrylic silicone metallic coating, to prevent rust. They look fantastic behind any open or Mag wheel. Ultra Street is packaged in a Gold High Gloss very distinctive designed box sure to grab customer’s attention when sitting on your shelf. Protex groove brake discs are grooved for more efficient braking performance and shorter stopping distances. The hat/hub, rim and grooves are finished in a black acrylic silicone metallic coating, preventing rusting. Packaged in its own distinctive silver box, Groove packaging is equally attractive to customers. Price pointed slightly under Ultra Street, Groove brake discs provide an affordable upgrade for most popular vehicles. Want a pair of Protex Ultra Street / Grooved Discs?